"You can't believe the raw talent in jail that is behind bars. And they're ready to challenge you. In here, people say, 'Oh, we haven't really heard of you.' Then it's, 'You had the world record? OK, now we know.' That means something." - Tim Montgomery in a 3-hour interview with ESPN.com from a federal prison in Montgomery, Alabama. How the world of track and field has advanced since Montgomery set the 100m world record of 9.78 in 2002, years before he and partner Marion Jones would both end up in jail. A 100% Recommended Read. Best Read In The Industry: LRC's Week That Was Last week was a little light in terms of big events so we highlight the efforts to save the Millrose Games, tell you how the LetsRun.com audience is the smartest on the planet, talk about Pre-NCAAs and give out lots of free training advice. Recommended Read: Bolota Asmerom Talks Running As He Prepares For New York City Marathon Asmerom has been a man of near-misses and impressive performances. Can he hit it big in New York City on the second try? *Grete Waitz, Joan Benoit And Deena Kastor To Speak Together In NYC 3 marathoning greats will talk on Thursday night at 6:30 pm in Manhattan's Times Center. Dathan Ritzenhein Writes About Why His Half Marathon Showed Him The Old "Ritz" Is Back About 70% of LetsRun.com readers were more excited about Ritz's 12:56 than his bronze at the World Half, but Dathan is clearly more thrilled with his ability to compete aggressively in Birmingham. *Article From Armory Website With Photos, Video Someone email us if we are wrong, but hasn't USATF been involved with this meet for years? *Doug Logan Blogs On Why The US Has Lost Its International Athletic Political Capital On a different topic, Logan insightfully discusses why he thinks the US can't land the Olympics and other major intl. sporting events. A worthwhile read. DII Shippensburg's Neely Spence Wins Lock Haven Meet And Beats West Virginia Stars Spence now has two high-quality wins in a row against serious D1 competition. Two weeks ago at Paul Short and this weekend at Lock Haven/Penn State. On Friday, she took down WVU's NCAA All-Americans Keri Bland and Marie Louise Asselin. Blue Men: Luke Puskedra Wins And Leads Oregon To Victory Over #2 NAU And #3 Alabama Puskedra had a subpar opener but returned to form to lead Oregon. It's worth noting, however, that NAU star (and World Champs runner) David McNeill had a subpar day, finishing as NAU's 6th man. If he was only NAU's 3rd man, they would have beaten Oregon. Thread: Oregon Men Win Blue Race in an Upset !!! Blue Women: Jenny Barringer Leads Colorado Women To Surprise Win At Pre-Nats If anything, this weekend was vindication for the knowledge of LetsRun.com viewers, who ranked both the Oregon men and Colorado women much higher in the LRC National Cross-Country Polls than the coaches. The Buff women were only #19 in the country. Barringer crushed the field as expected, but her teammates backed her up very well for the win over Florida State and #4 Oregon (who finished 3rd). Thread: Jordan Hasay THIRD at Pre-Nationals to Jenny Barringer and Susan Kuijken! White Men: Chris Derrick Defeats Samuel Chelanga, Stanford Cruises At Pre-NCAAs Chelanga opened up an early lead, but Derrick attacked the course the 2nd half and got the win. Thread: Post Pre-Nats who is now individual favourite? White Women: #1 Washington Women Cruise At Pre-Nats Illinois' Angela Bizzarri got the individual win. The Huskies cruised without PAC-10 runner-up Mel Lawrence. Thread: Chili Pepper Invite: Fernandez injuries? Virginia Men And Emil Heineking Defend Turf, Take Down Syracuse Heineking won by 20 seconds over the talented field at "Panorama Farms." Penn State National Cancelled! (LRC Boards) Half a foot of snow in mid October was apparently too much, as message board posters wonder if former Nittany Lion coach Harry Groves would have cancelled the meet. Some teams headed to nearby Lock Haven University to race instead. LetsRun.com Pre-NCAA Polls The LRC voters aren't buying into Stanford at #1, as they chose Oklahoma State men and Washington women as the top teams in the country heading into a big weekend of action. Scam Artist Rips Off His Successful Father First Then New York Road Runners In Multi-Million Land Purchase NY Times The multi-million or billion dollar scammers must be totally insane to think their plans are a good long term idea. We Hadn't Thought About This: Some Title IX Bureaucrats Refuse To Count Cheerleaders And Dancers In The Title IX Tally USA Today debate. What would happen if Title IX were ended today? Would universities on average fund fewer female sports teams? We don't know the answers but do know a lot of bureaucrats would be out of work. In Europe, they don't even have university athletic teams (clubs rule instead) and here we're constantly fighting about college sports issues like Title IX. Berlin Long Jump Medal Ceremony With Granddaughters Of Jesse Owens And Luz Long Is Voted "Peace Image Of The Year" Somewhat lost in the craziness of Worlds was the men's long jump medal presentation where Luz Long's and Jesse Owens' granddaughters were there to present the gold medal to deserving American Dwight Phillips 73 years after Owens won LJ gold in Berlin. If you don't know the story of these two unlikely friends from the time of Adolf Hitler and segregation in America, click here to read one of many accounts. 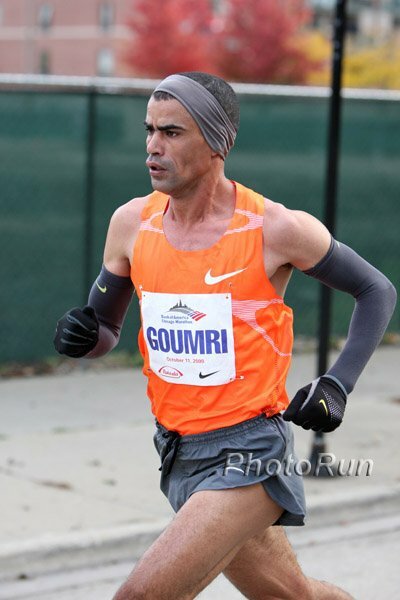 Recommended Read: Wonderful Profile Of Abderrahim Goumri, One Of Morocco's Great Marathoners Freelance writer Courtenay Morgan Redis writes a great piece that helps us get to know Goumri as someone other than "Mr. Silver." There seem to be very few stories about the Moroccan runners so take the opportunity to read this one. Photos of Goumri and other Chicago competitors here. Warm Profile Of Funny Marathoner Wesley Korir Employee #1 watched Korir's 2:08 win in L.A. and still thinks it is the most inspiring performance he's seen in 2009 (though Ritz is close). This profile of Korir shows he has hopes of building an orphanage in Kenya and helping bring peace to his home country. Video Of Usain Bolt Playing Cricket BBC video is short but shows Bolt bowling (pitching) and he looks like he's pretty good. There's another video in our right column that shows him batting. Fascinating Article On The Almost Century-Old Rivalry Between adidas And Puma These two major brands began in the same town in Germany over 80 years ago but split when the better-looking of the co-founder brothers allegedly slept with his brother's wife. *Hakone Ekiden 20k Qualifier Yields 11 Sub-1 Hour Performances By Japanese Collegiates Brett Larner of Japan Running News reports on an amazing race. *LRC: Larner On The Boards: "NCAA XC is nice and all ..."
*Hakone Ekiden Trials From The Inside Swiss runner Christian Sommer ran the Hakone trials and wrote about the experience. Million Dollar Man: Sammy Wanjiru Will Race Zayed Intl Half Marathon On Jan 7 For Chance At $300k Purse (Pat Butcher reports) Sammy Wanjiru won $175,000 in Chicago, will earn $500,000 for the World Marathon Majors overall win, and could win another $300,000 in January. UK Athletics' Charles Van Commenee Names New National Event Coach For Endurance George Gandy coaches big-time miler Lisa Dobriskey and will help Ian Stewart at the top of the distance coaching ranks. *More Interesting UK News: 76-Year-Old Briton Runs 111 Miles In 24 Hours In "Self Transcendence Run"
Amsterdam: Unheralded Gilbert Yegon Breaks Haile G's Course Record By 1 Second, Eyerusalem Kuma Wins It was a good day for men's debutantes as Yegon won and Elijah Keitany was 2nd in his debut. Yegon was cramping at the end as this video shows, but he just nipped Gebrselassie's course record. On the women's side, Kuma won by over 2 minutes and Hilda Kibet, sister cousin of World XC Champ Lornah Kiplagat and sister to world 5000m silver medalist Sylvia Kibet, was third in 2:30:31 in her marathon debut second marathon attempt. Beijing: World Champion Bai Xue Wins Slow Race, Kenyan Samuel Mugo Wins In 2:08:20 PR The race served as the Chinese National Games as this article indicates and Bai was content to just get the win. This was Mugo's 2nd big win in China, as he won Xiamen in 2:08:51 in January. South Korea To Offer $1 Million USD For A Gold, $250,000 USD For A Bronze At 2011 World Champs To Its Athletes It's trying to become the first host country to not get a medal. 100-Year-Old Throws The Shot 4.07m Wejo and Rojo's grandma turns 100 in March. She'd better start training. Usain Bolt To Play With Pro Cricket Players Of course cricket was more interesting to him than track growing up. One Of Our Old Favorite Websites Deadspin Highlights "Skirt Chaser 5k" There should be more events like this. Brief Chat With Jorge Torres Olympian Jorge Torres talks about his race plans for New York (hoping for 2:10-2:11:30), his Mom's 100% recovery from her car wreck, and his training partners in Boulder, including 2:12 man Jason Hartmann (profile here). Good read. Boulder Daily Camera Profiles New 2:12 Man Jason Hartmann Hartmann is coached by former world record holder Steve Jones for Tempo Sports in Boulder. This group touts their faster-than-marathon-pace training, which clearly is working for Hartmann, who was the most underappreciated 9:01 guy in high school because his teammate was none other than Dathan Ritzenhein. Recommended Read For Coaches NY Times Health Article Goes In Depth On Exercise And Sickness Last week, we learned that mice were smarter after running tempo runs. This week, we learn that running a long, hard run while sick or exposed to illness is worse than resting and way worse than jogging easy. Congrats To ING New York As They Ink Two More Past World Marathon Major Champions For 2009 In Robert Cheruiyot And Salina Kosgei Salina Kosgei is a very good runner and if she's in shape, she may win New York like she won Boston back in April. "Mwafrika," past champ of Boston and Chicago, is obviously a stud when he's "on," but he finished out of the medals in Boston and Berlin WCs this year. 15 Sub-2:09 PRs Will Fight For Frankfurt Marathon Title The article points out that Frankfurt is the deepest marathon in Germany. Book Of The Year? "Manthropologist" Tells Us Men Why We Are The Most Pathetic Men In The History Of The World Men, we need to get our act together. It turns out we are slower, weaker and in general more wimpy than any group of "men" in the history of the world.